500 kg of glass marbles, each with a diameter of 14mm. This work is one of the two identical installations subsequently made from the original piece that was conceived in 1995 for an exhibition at the British School at Rome. 'life/live. La scène artistique au Royaume-Uni en 1996, de nouvelles aventures', Paris 1997 (original installation illustrated in colour, pp.70-71). Rome, The British School at Rome, 'Mona Hatoum', Nov.1995 - Jan.1996 (detail of the original installation illustrated on the cover of the exhibition brochure). Bremen, Neues Museum Weserburg, 'MINIMAL MAXIMAL. Minimal Art and its Influence on International Art of the 1990s', Oct. 1998-Jan. 1999 (original installation illustrated in the catalogue in colour, p. 131). This exhibition travelled to Baden-Baden, Kunsthalle, Jan.-March 1999, and Santiago de Compostela, Centro Galego de Arte Cotemporanea, April-July 1999. 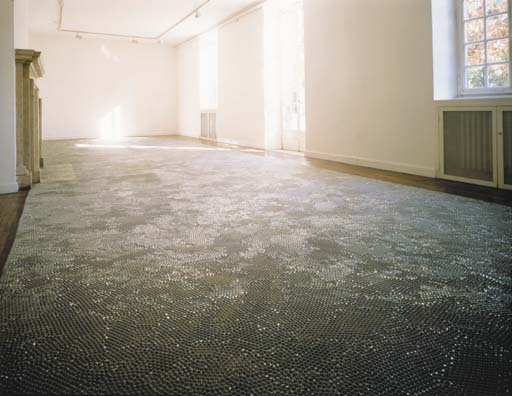 The 1995 Marbles Carpet embodies Lebanese born Mona Hatoum's particular inclination for the minimalist archetypes. The theme of the carpet is especially recurrent in her oeuvre. Successively a praying mantle made of nails, an entrails rug, or a beautifully transparent marbles carpet, the materials used by the artist are charged with controversial, metaphorical or emotional references that contrast the strictness of the geometrical shapes. The later division of the piece into two identical carpets has not altered its spectacular quality: after its cellular division it follows the walls of the room it occupies, only leaving a very narrow band to walk around. In this work, Hatoum forces the viewer to resent the overwhelming presence of the sculpture that not only expand the medium of sculpture but also extend the body of the artist in the third dimension.